The Leadenhall Market was established in the 14th century around a manor house with a lead roof. It became one of the best places in London to buy meat, game, poultry and fish. In 1666 the market was destroyed in the Fire of London. Over the next few years new buildings were erected on the old site. Leadenhall Market is at present the largest, and perhaps the best supplied market in Europe. 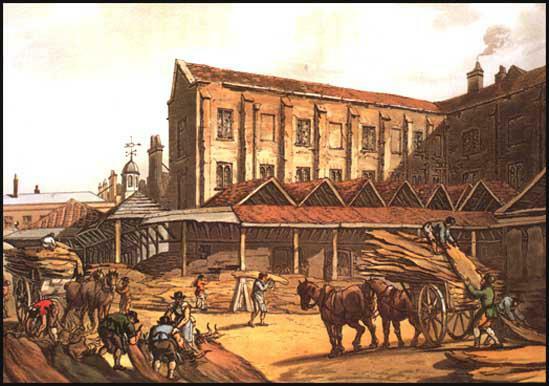 It consists of three courts; the first is called the Beef Market: on Tuesdays this court is a market for leather; on Thursdays, for baize and wool; on Fridays it is a market for hides; and on Saturdays, for beef. The second court is still called the Green Yard and is now a market for veal, mutton, lamb, etc. in the middle, and on the south and west sides, are houses and shops for fishmongers. At the east end is a market house erected upon columns, with vaults beneath, and rooms above; under the latter are the butchers' stalls: there are likewise a bell-tower and a clock.